Contemporary industrial development of industrial products defines a new attitude towards their innovative obsolescence, which is of major importance to physical obsolescence. 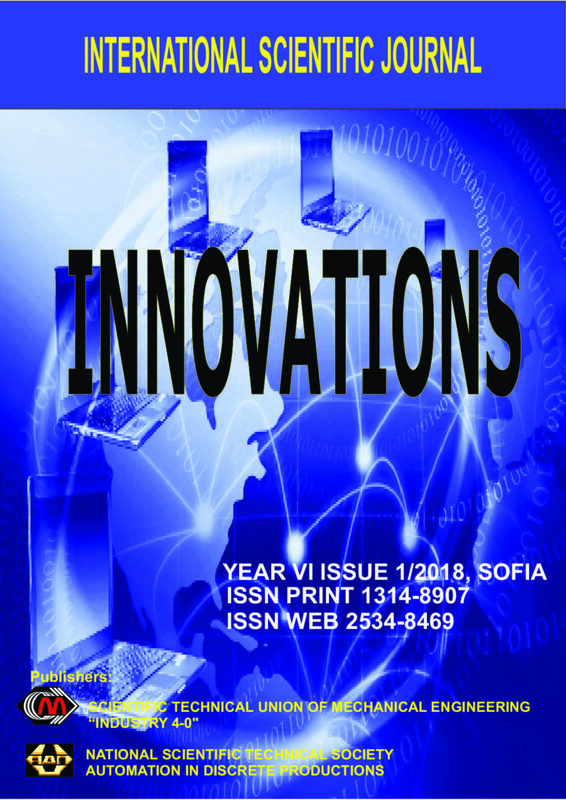 The purpose of this article is to clarify the essence and establish the impact of innovation obsolescence on the socio-economic and social outcomes of this activity. Assessing the impact of this activity on the scale and timing of manufactured industrial products is of the utmost importance for the timely removal of the negative effects of the innovation impact. It arises under the impact of new innovative solutions with more advanced, more productive and better techno-economic indicators than those introduced before. Intelligent production is the future of industrial production. They are leading the way to a new industrial era and best define the concept of the Fourth Industrial Revolution. And getting real-time data on quality, resources and costs provides significant advantages over classical production systems. Intelligent production must be built on sustainable and service-oriented technological and business practices. They are characterized by flexibility, adaptability and self-learning, resilience to failures, and risk management. The high levels of automation, on the other hand, become a mandatory standard for them, which is possible thanks to the flexible network of production-based systems that automatically monitor the production processes. Flexible systems and models that are capable of responding in real time allow internal processes to be radically optimized. Production benefits are not limited to one-off production conditions, and the capabilities include optimization through a global network of adaptive and self-regulating manufacturing components belonging to more than one operator. Planning of resources in enterprises maintains all internal processes, as it provides the opportunity to follow up and analyze engineering, human resources, production, delivery chain, accounting. Important aspect is the personal-configuration of own business rules in the software. Today Industrial Enterprises are facing the challenge of the 4th Industrial Revolution. Steam Power, Henry Ford’s Assembly Line, and Proliferation of Coal-based energy etc. – each of these developments in the evolution of manufacturing fundamentally changed the way products were manufactured and the way manufacturers moved products from factory to the customers. The present paper discusses the term “Industry 4.0” and its main characteristics, as well. Furthermore, a theoretical framework for evaluation the key technologies and concepts with respect to their impact on the production engineering and management. Also this paper discusses and some given arguments why manufacturers need to make changes in their traditional view of the functioning of the production system in term of “Industry 4.0”. In this paper is presented an exergy analysis of low power steam turbine with one Curtis stage which drives the main feed water pump (MFPT) in the conventional LNG carrier steam propulsion system. It was obtained an insight into the exergy efficiency and the exergy destruction change during the variation in turbine developed power. Measurements of necessary steam operating parameters were performed in seven different turbine operating points. Increase in turbine developed power from 50 kW up to maximum power of 570 kW causes a continuous increase in turbine exergy efficiency and highest exergy efficiency was obtained at the maximum turbine power. Turbine exergy destruction is influenced by steam operating parameters, steam mass flow and turbine current power. MFPT is balanced as the most of the other steam system components – maximum exergy efficiency will be obtained at the highest turbine (steam propulsion system) load on which can be expected the majority of LNG carrier operation. In this paper a model for optimal hydro-thermal coordination of a power system is proposed when contracts for power import and export power are available. The power flows outside the localized area of the local power system are divided into planned and planned quantities in order to assign different penalties for them in the cost criterion. The model also introduces the work of thermal and hydro power plants by separating each unit with a linear approximation. The resulting model is a mixed-integer linear programming problem.